The DiMarzio Paul Gilbert Injector '67 Set contains 3 well-designed pickups: the Injector Neck (neck), the Area 67 (middle), and the Injector Bridge (bridge). Easy to install, they'll bring a collection of Paul's favorite tones to your Strat-style guitar while reducing noise. DiMarzio first heard about Paul Gilbert in the 1980s. Billy Sheehan reported about an amazing 18-year-old who had recently arrived in California and had blown everyone away with his musicianship, speed, and awesome technical ability in Racer X. DiMarzio immediately asked Paul to become an endorser. It was the start of a great relationship. Recently, Paul has been heavily into DiMarzio Area pickups. He's also been playing a lot of Racer X-style instrumentals, so the time was right for signature Paul Gilbert single-coil sized DiMarzio pickups. The outcome of this teamwork is the new Injector Neck and Bridge Model pickups. The Injector Neck Model has a modern rather than a vintage sound. It's warmer and louder (160mV output) than a typical vintage single-coil - and of course it's hum-canceling. It's also faster. The Injector Neck Model tracks high-speed solos at high gain without becoming either thin or muddy, and has a very full, well-balanced, clean sound. It has about 40% less magnet-pull than standard single-coils, and this is essential for the superior speed and dynamic range with which this pickup responds to pick attack. Paul's setup on the guitar he played on Fuzz Universe was Injector Neck Model in the neck, Area 67 in the middle, and Injector Bridge Model in the bridge. The Injector is a lot louder and warmer than the Area 67 but the combination produces varied tonal colors in the 2 and 4 positions, with the Area 67 alone providing vintage tone and the Injector Neck & Bridge for heavier sounds. The Monterey Pop Festival of 1967 was a watershed event in American music. When it was over, the world had heard and felt the sound of a Strat in the hands of a master. Single-coils in 1967 were bright and very clean. And, of course, they hummed. DiMarzio captured the classic bright and clean sound but totally eliminated the hum with their patented Area technology. They also reduced magnet pull by 40% for improved sustain and clarity. The Area 67 has the chime of 60s pickups, and the 2 and 4 positions are light, bright and quack-happy. 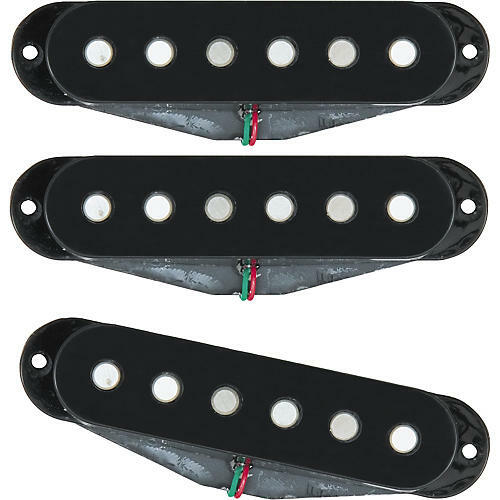 Strat pickups in the late 1960s used full-strength Alnico 5 magnets. The patented magnetic field of the Area models is more efficient and focused than it is on "true" single-coils, which allows us to use Alnico 2 instead. There's much less magnet pull, but no loss of output. This is a major advantage in the neck and middle positions, where sustain and intonation can both suffer if the strings are exposed to strong magnetic fields. In the bridge position, the patented technology of the Area '67 produces a sound that's very bright but not brittle. The Injector Bridge Model is one of DiMarzio's hottest hum-canceling models (185mV output) with six individual Alnico magnets. The sound is not like a vintage single-coil - highs are bright but not glassy, and lows are solid and defined. It was designed to work equally well with rapid single-note arpeggios and power chords without becoming muddy or compressed. It has about 40% less magnet-pull than standard single-coils, and this is essential for the superior speed and dynamic range with which this pickup responds to pick attack.